If you must bite the hand that feeds you, be gentle. You still want them to feed you. I like to put the bitey on mum, but not so hard that it breaks the skin. Hard enough to let her know to quit messing with me! I will be teleporting off to Karl & Ruis's wedding. This should be an interesting day as the wedding will be held in a spaceship. I don't think I have been on a spaceship before. So I will see most of you kitties there. 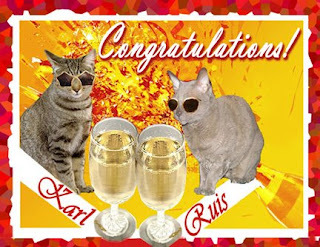 Concatulations to Karl and Ruis, may you have many happy years together. This tulip is multicolored but the rest of them mum planted are all solid colored. But it is pretty anyway. Below you can see the rest of the tulips as one color. These are the last of the tulips to be blooming. Plus mum and I saw a hummer bird the other day! Happy weekend. Thanks for helping CFHF out Kimo and Sabi. It is me, Derby, who else! 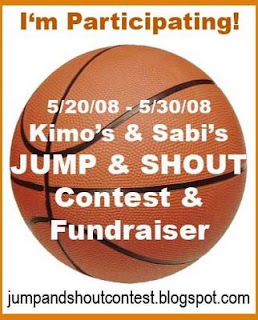 Jumping and shouting for Kimo and Sabi's contest. I hope you like my pictures guys. It got furry cold again, even mum got a heavy shirt out to wear on Tuesday. Then when she was sitting and reading she wrapped the warm kittie blanket around her legs. Then she had to get up to fix dinner and I moved in to get some of the warmth and mum saw me, so guess what she did? She covered me up with the blankie! I normally don't like to be under the covers, but this felt good. She kissed me on top of the head and wished me a nice nap. Thanks mum! Mr Hendrix asked about the War Dogs from the purrade. They are woofies who have been in the services as part of the K-9 corp and are now retired. So these guys have served our country as well. But like the rest of us, wish they could just be Paws for Peace. They had lots of woofies but mum couldn't get pictures of them all. Lots of German Shepherds, Rottweilers, Poodles, even a small little Yorkshire terrier, who didn't walk the purrade route but rode in a an upside down combat helmet carried by the owner. I know a lot of us don't like woofies, but we owe them a paw of gratitude for helping out the beans. Miz Allie Cat tagged me for the 7 Useful Things Meme! So I had to think, between naps, of what I do that is useful. 1. Catch mousies for mum. 2. Purr mum to sleep. 3. Make her clothes look better by putting fur on them. 4. Make the windows look better in the house by sitting in the window. 5. Snoopervise mum as she keeps the house and yard in order. 6. Keep mum company when she is home. 7. Be the guard kittie when mum is not home. Whew, I do a lot around here! I sure hope mum appreciates what I do for her! Now it is time for another nap. I had a quiet Memorial Day. Mum and Grampie went to the purrade and said it was a lot like last year. They did have horsies in the purrade this year and lots of woofies. When they got home mum grilled out side, but they ate their lunch inside. I waited to get some but mum said what they had wasn't good for a kittie. It was a nice warm day too until late evening, then it got furry cool again and mum closed up the house so we didn't have to turn the heaty thing on again. ManCat Monday will return next week. Mum and I had a quiet weekend for far. Mum did little bits outside, watched cars go fast, did laundry, read a book. Kept hugging me! I am not a cat that really likes hugs, at least not from humans! But our Holiday of Hugs continues. I helped mum with the laundry! Yes the basket is empty, now you can go and do something else. Mum and Grampie are going to go watch the purrade like last year. Then I think chill for the rest of the day. Enjoy the rest of your holliday! Be safe. Gosh, Sammy, Miles and Billy hit it on the head, the hugs thing is great! Plus Sanjee has declared that going forward the fourth weekend in May will be the Holiday of Hugs weekend. If Sanjee says so, it will be so! 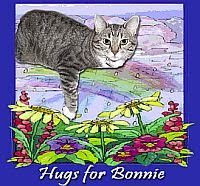 This year we did it to remember Bonnie and her sudden departure to The Rainbow Bridge. We will use it to remember those who have gone before and those we love who are here. 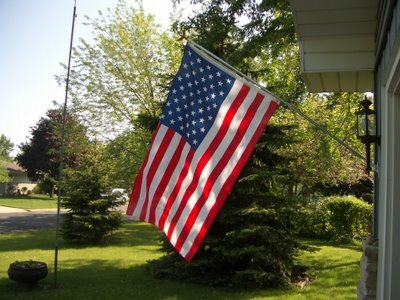 The beans use this same weekend to remember those who have served our country. I have been working my way around the Blogosphere and it is amazing the love we have out there for each other. We don't show it enough, so this was a good thing to do. In my world I have been busy snoopervising mum. She got what she needed from the flower store and started making things pretty in the baskets and such around the house. Here is her big box of impatients waiting to be put where mum wants them. New dirt in the baskets and in PFE too! Mum moved the planted baskets to the back patio where Virginger was waiting for them. Here is Virginger climbing up in the flowering crabby apple tree. She is happy and the tree look pretty too. Mum helping Virginger check out the birdie nest boxes. Virginger reports that there are nesting twigs and such in side both of these, but no baby birdies or any nesting birdies at this time. Here Virginger is checking the basket after mum hung it up. Grow little flowers and look pretty. I am snoopervising all of this from inside the house. Mum is doing an OK job, not making too much of a mess. What do you mean that I am sleeping on the job! Mum you were doing such a good job, I didn't think I had to watch your every move. They say power naps are good for you when you are on the job! So everyone continue to have a good and safe weekend. Mum is working to get all of her chores done today. The she will rest tomorrow and watch cars race. She says there are THREE major things to watch. The Formula One race from Monaco, Indy and Crashcar at night. I think I will nap. Use a soft paw to reach out and touch your beans. It will melt their hearts. That is me sitting next to mum and just putting one paw on her leg. Just a way to show her I love her. Just like I want to reach out to Victor and his beans for Bonnie. 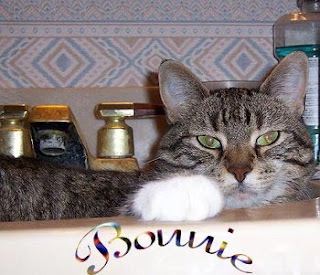 Our hearts are heavy since one of our good furiends, Bonnie Underfoot, went to the Bridge so suddenly yesterday. Bonnie you will be missed very much. By your beans, Victor and all of your blogging friends. I will remember the night we danced a few weeks ago when we dropped by your house for the after party. Dancing jive to the jazz that was playing. A pleasant memory to remember you by. Thanks to Chase for the picture. Purrs everyone. Miles & Sammy Meezer, with Billy the Kitten have suggested a day, heck the lets do the whole weekend, of HUGS. A holiday of hugs! We did this last year after a few kitties had a dust up. Like the Meezers said we don't take enough time to say what we should. we are starting to get more flowers. The lilacs are blooming, finally. Mum looked back and last year they had bloomed by May 11, mum took these pictures on May 22, so things are almost 2 weeks behind what they were last year. Mum went to the flower store and they didn't have much to buy since it is so cold to get things to grow here! But she did find a few things. Based upon the classic song written by John Lennon and Sir Paul McCartney. As mum says songs from her childhood. Mum holds my paw furry often, we sit near each other and she just reaches over to touch me and let me know she cares. I sometimes give her hand a lick or two to let her know I love her too. It is our way of bonding. Mum went to the flower store and bought some flowers, so she can soon make the outside pretty here. Last year she was about done with doing flowers, but this year is so cold she hasn't done much of anything. She is bummed and so am I. Soon we may have some nice pretty stuff like this! I love to play with my toys and it makes mum smile. The other morning I was pouncing and jumping on one of my toy mice. Gotta keep in shape for the real thing. If you haven't done so, go over right now and buy tickets for the Cat Friends Helping Friends Raffle. 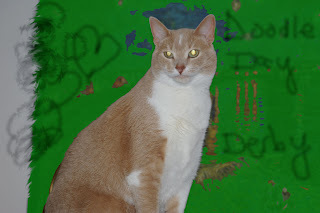 We are raising funds so we have green papers to actually help out th kitties. Go buy, NOW! Today is your last day to buy tickets for this current raffle! Just go buy tickets, help out kitties. Get your bean's plastic thingy out and buy, buy, buy. You know you have lots of beans in your life that you need to buy gifties for. Weddings, anniversaries,graduation, Dad's day, purrthdays, heck get a really early start on your Christmas shopping. There are seven signs as follows. You can see pictures of all of these at the Cat Friends Helping Friends blog and buy tickets, lots of tickets. The funds will be used to build up our fund so we can actually help kitties! 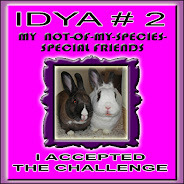 That is furry important that we get funds and we are trying to give you a chance to get something in return. The gang at CFHF will have stuff every week, big stuff, little stuff, so go check things out every week. Mum keeps coming home with stuff that she says will be on CFHF soon. I hope you will support the CFHF and in turn kitties. Mum loves the signs, her favorite is the chunky dunk one. Says that would be her! Scatter objects to make a pleasing pattern. Careful to not break anything. Diva Kitty Sophia and The Taylor CatSSSSS wanted to know if I ever knocked the flowers out of the vase when I did my FFSF on April 18th. Yes I have and here is proof! You can see the flowers on the floor and the white thing that holds them on the floor. The white thing did not break and it is something that would break. Along with mum's temperature thing that reads how hot or cold it is outside. Here she is multi-tasking, reading, taking a picture and give me scritches! AHHHHHH, that feels so good. I think in another week we can maybe restart Flower Friday. The stuff is starting to bloom and all outside. I will just have to get mum outside to take pictures of stuff at their peak. Mr. Hendrix tagged me for a meme. The rules of the game get posted at the beginning. Each player answers the questions about themselves. At the end of the post,the player than tags 4 or 5 people and post their names, then goes to their blogs and leaves a comment, letting them know that they have been tagged and asking them to read your blog. Let the person who tagged you know when you have posted your answer. 1.What was I doing 10 years ago? – I wasn’t around. Maybe even my mumcat and dadcat weren't around. 2.What are the 5 things on my to do list for today – Eat, sleep, mooch treats, snuggle with mum, nap. 3. 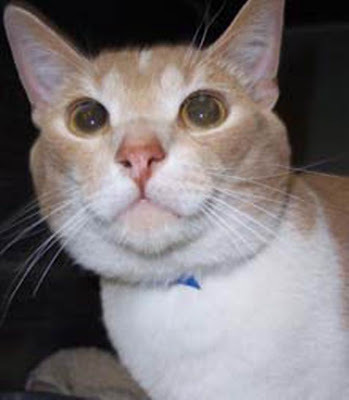 Snacks I enjoy – Pounce treats, Feline greenies. 4. Things I would do if I were a billionaire – Set up an endowment for Cat Friends Helping Friends. Then CFHF would be able to help lots of kitties and never run out of money. You gotta go check out the latest raffle at CFHF it is good. 5. Three of my bad habits – putting the bitey on mum, yakking up on her nice light carpet, eating mum flowers and plants. 6. Five places I have lived – With my mom cat, my first humum bean, the HAWS shelter, and here now with mum in our lovely house. That is only four, but those are the only four places I know I have lived. 7. Five jobs I have had – Purrrer to sleep, attack cat, mouse chaser, treat moocher, fur shedder. The weather gotted nice today so mum could open the windows when she came home. But the wind is furry big. Mum also got out some of the bird stuff and Mr Wren was checking out this one house shaped like a ginger cat head as soon as mum hung it up. Here is a picture of the house from another summer. Mum hung this in a different tree this year. We will have to see if they actually take up residence. Mum laughed furry hard when she read this quote of Jay Leno. Says it is furry true! It is doodle week and here is my doodle. I am not furry good at doodles even with help from mum. But Not The Mama is donating green papers to CFHF for each doodle. So you know I gotta do a doodle. Plus, go over to the CFHF blog and check out the latest goodies that are being raffled off. Matter of fact you need to check CFHF every week as there will be raffles or auctions every week. Mum and others are cooking up neat stuff! I had a quiet mum's day as mum was gone most of the day. She went off to be with Grampie and didn't come home until later in the afternoon. But I did get a chance to snuggle with her before she left and after she came back. So that was just fine. Gather those who love you around you in truth and in spirit. You will never be alone. Here are Virginger and I with some of our little squillions and this was before we added to the gang! I got a surprise on my Gotcha Day. Mum took me to the vet for my rooster shots! That was not the way I wanted to spend my day, that is for sure, even if it was only for a short part of the day. If I had only known I could have tried this on mum's metal monster. Oh wait, I don't have claws, maybe I would need to use my teeth. But the VET said I was good to go for another year or another 3,000 teleports, which ever comes first. 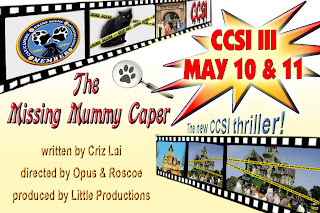 You can check out the premier of the newest CCSI episode The Missing Mummy Caper. Well my mum is right here, so she isn't the missing mum! 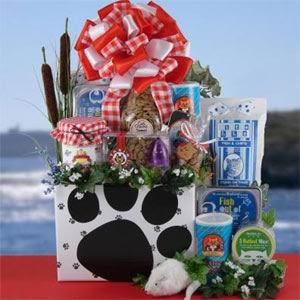 I worked furry hard and Sassy appreciated all of our hard works, so send along this wonderful basket of goodies. Now I can relax and nip out for a while. Hope you enjoy the show. Karl says he has photos of some hanky panky on the set. Well Karl and just go ahead and publish them. A ManCat has to let his furs down at some point! It was three years ago today that I came home to live with mum and here is my shelter mug shot that made mum fall in love with me. Well that and my playfulness when she came to visit me. She had her eye on another kittie but I won her over! 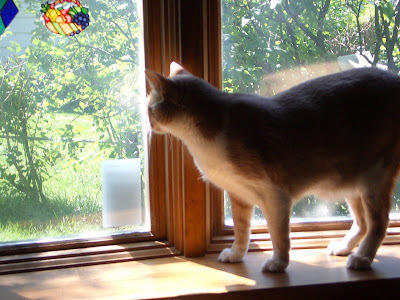 One of the first places I checked out when mum brought me home and let me wander around was the window in the kitchen. It is nice and roomy for me to be here and look out the window at the flowers, birds and whatever else that is out there. I am sure happy I have a nice home, as are all of us blogging kitties. I hope all of the kitties now in shelters find a wonderful home to live in. Sorry I am a right pawed kittie so I guess I am not a psychic. I can't fortell your future, sorry. Didn't we have fun with our Derby Day Party? The gang came over and we had our own races, basically THOE, to one end of the house and back, then up and down the stairs to the dungeon. Lots of purrs for Eight Belles, she was helped to The Bridge right after the race. I hope all of our furiends up their made her welcome. Maybe she and Barbaro can make wonderful race horses in heaven. Oh yeah a horsie named Big Brown won the roses. Mum did it again this weekend. She left me alone to go play in traffic again. Mum said she and her friends watched the Derby race and had a mint julep to make it official. But they gotted all bummed with the after race stuff. They all picked a horse and mum had Eight Belles, so she was really bummed. But she explained to me the the horsie would have never recovered from such a bad injury. So the VET's did the best thing for her. Race in Peace Eight Belles. Stop on over, we will raid the treat cupboard, big cold box for the ham and just party, watch the horsies run and run and run! It is my day, Derby Day. My real Gotcha Day is May 7 but I have to party the day away. I just gotta. 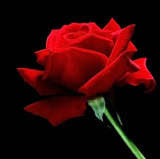 So the horsies will be running for roses. I wonder if they get to eat them if they win? I made mum let me take the quiz again. I got a much better result! I am a Tiger!!!!! Yeah, this is much better! Calm and cool on the outside, feisty and determined on the inside, Derby is everyman athlete Tiger Woods! 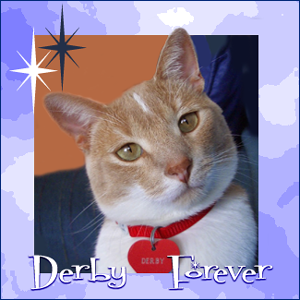 Derby proved at an early age that he had the skills to pay the bills, running circles around the competition when he was just a wee whippersnapper. Thanks to his tremendous successes, Derby has set aside an entire wing of his luxurious shelter just to house his collection of trophies and ribbons. A high-class pet with exquisite taste, Derby prefers to be seen with long-legged female mates, preferably those bred from Scandinavian lines. Unwilling to rest on his haunches, Derby has no time to hang out at the 19th hole and pet himself on the back—he's got a lot more green grass to frolic across before throwing in the towel.